The Scourge of the South and an emerald-green kraken that spreads its leafy tentacles out to overwhelm everything. “I think I have a way to stop it,” Dr. Freddie Combs said. He was sitting with a group of scientists at the Kudzu Fight Council. It was, somewhat ironically, located in Alaska. 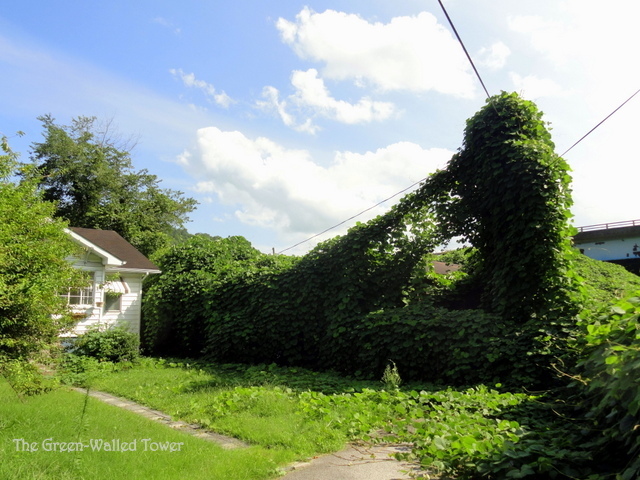 The feeling was that kudzu was so dangerous it was best for the Council to employ scientists who were deathly afraid of it. There was no chance of them sympathizing with the enemy that way. “What’s your idea?” the Director asked. “I have one that is fool-proof,” a tall, dark scientist named Dr. Brawn said. He had a crazy look in his eye, which in scientific circles is referred at “that Nobel look”. The rest of the room hushed. “Does . . . it grow as fast as normal kudzu?” the Director asked in a shocked voice. “That is a good feature,” the Director admitted. “Fine, we’ll try it. I can’t think of anything better at least. Four months later, the continental United States was abandoned. 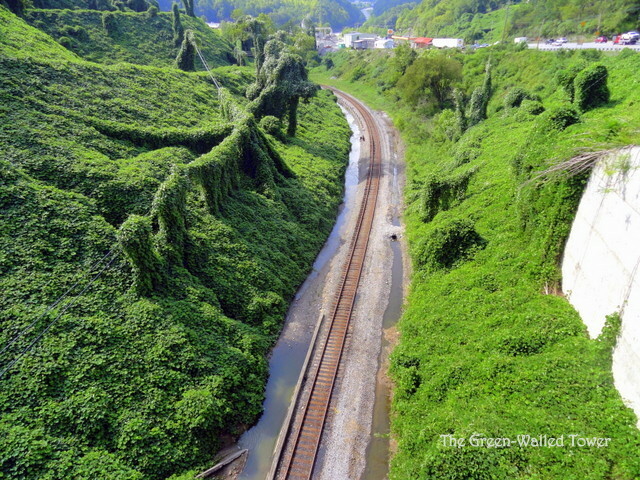 Mexico was considering building a huge fence to keep out the super kudzu scourge. Canada had nothing but its cold weather and even that wasn’t an effective barrier anymore, thank you very much global warming. 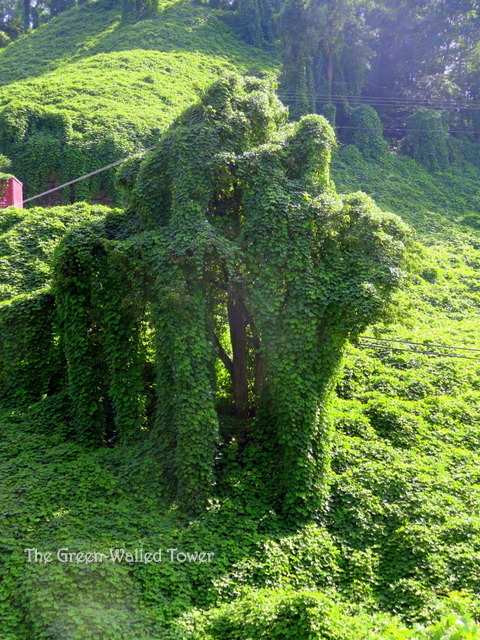 People tried to shoot at the rampaging super kudzu, but after it began to mimic a whimpering puppy, they found they just didn’t have the heart. Finally, all the survivors who could afford it gathered in a huge underground bunker on the island of Newfoundland and waited, hoping that the kudzu would die out or simply go away. They waited for years. Their phone and Internet went out because no one wanted to go outside to maintain them. After three years, the debate began: to go outside or not. 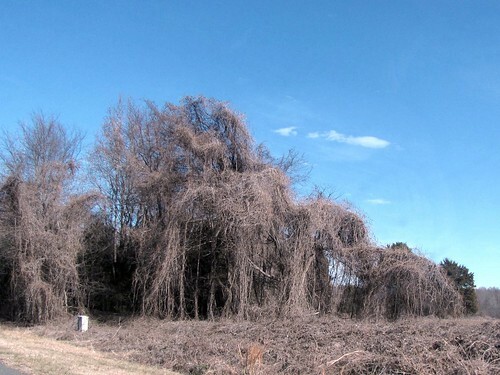 Some argued that the super kudzu must have killed itself off by now. In any case, it couldn’t have made it over the water to the island. Some questioned why they were in a bunker at all, but more pessimistic individuals shushed them, reminding them of how quickly North America had fallen. “It’s probably crossed the Atlantic Ocean by now,” some said. One boy, though, had had enough. “I’m going outside,” he said. He ran for the hatch and began to spin the wheel to open it. Outside the sun shone brightly and a single tendril of kudzu crept slowly up the stonework towards the soon-to-be-opened hatch . . . 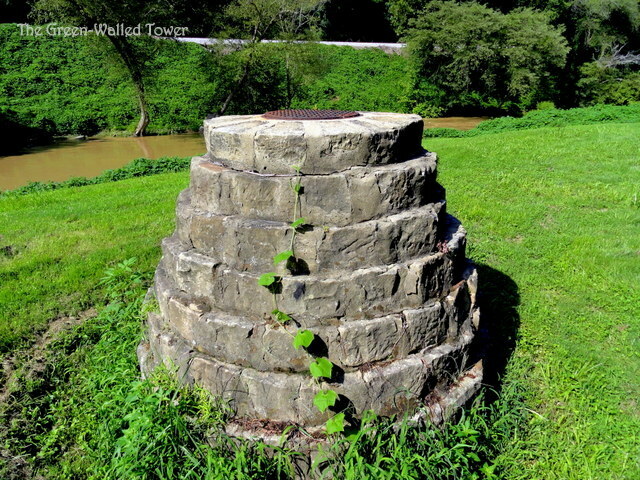 This entry was posted on Sunday, August 4th, 2013 at 10:15 pm	and tagged with creepy, fiction, invasion, Kentucky, kudzu, photograph, visual fiction and posted in Visual Fiction. You can follow any responses to this entry through the RSS 2.0 feed. If you can figure out an economic way, you can make millions. It’s a real epidemic down in the south. Great tale, David! That kudzu is some wild stuff. Everything is so green. Where my parents live, the whole country is covered in them. They can be beautiful during the summer when they are all green, but in the winter they turn into greyish-brown shrouds that look pretty creepy. I think I have a few I can share. 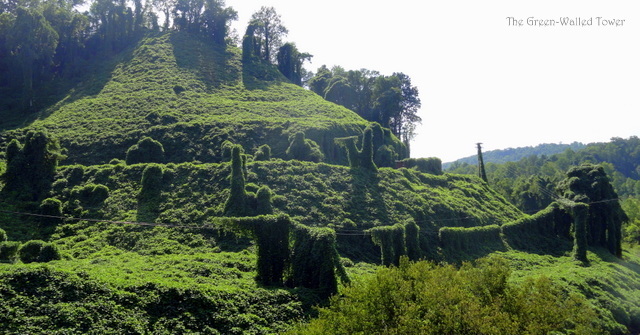 If you do a Google image search for “dead kudzu” you get a lot more. It really is pretty creepy stuff to see. News from kudzu covered Georgia: no giant rats here but we have only just begun to fight!! I think the ethanol usage is being checked into as we speak. That way we don’t use our own food source to create fuel. Ethanol from kudzu would be a great solution: use something that no one wants to make something that everyone wants. Hopefully it’ll work out.